Dramatic growth in data center throughput has led to the increasing usage and demand for higher-performance servers, storage and interconnects. As a result, we are seeing the expansion of higher speed Ethernet solutions, specifically 10 and 40 gigabit Ethernet, writes Bjorn Baera of Mellanox. Bjorn Baera is Sr. Marketing Manager for Mellanox Technologies, and is responsible for products that are used for high-throughput, low-latency server and storage interconnect in data centers. You can find him on LinkedIn. Dramatic growth in data center throughput has led to the increasing usage and demand for higher-performance servers, storage and interconnects. As a result, we are seeing the expansion of higher speed Ethernet solutions, specifically 10 and 40 gigabit Ethernet. In particular to 10 gigabit Ethernet (10GbE), IT managers are now faced with the challenge of selecting the appropriate 10-gigabit physical media, as 10GbE is offered in two broad categories: optical and copper. Many-core Servers - servers include more and more CPU cores to cope with data growth and application requirements. highly utilized servers using virtualization technologies such as VMware, Hyper-V, XEN and KVM. Storage Area Networks (SAN) - networked storage delivers services to multiple compute elements, both at block storage or file system. I/O Consolidation - usage of a single interconnect infrastructure for all communications needs: compute, storage and management. Data Center Network Aggregation - as the deployment of 10GbE increases, there is a need for higher speed switch uplinks for network aggregation in the data center (40GbE and above). When planning a new cluster cabling, IT managers are faced with the challenge of future proofing their investment, as well as the predicting future application requirements. When planning a future cable infrastructure, it is important to make sure that the physical infrastructure will support future application needs, and future technology roadmaps. IT or the data center managers prefer to avoid installing multiple cable infrastructures for separate application traffic requirements – such as High Speed CPU-to-CPU communication using 40Gbps Infiniband and Storage and Internet connectivity using 10Gbps Ethernet. IO consolidation, which is critical to reducing data center capital and operational costs, mandates that the cable infrastructure support new dynamics and challenges. As the adoption of private cloud applications increases, the need for low latency, large scale data centers is growing fast. Low latency is critical to ensuring fast response time and reducing CPU idle cycles; therefore, increasing data center efficiency and ROI. Two microseconds may not seem high at first; however, if we imagine a TOR infrastructure where traffic is passing 4 hops to reach the destination, as much as 10.4usec delay is introduced when using 10GBase-T. This is a significant performance penalty compared to using 1.2usec introduced by the SFP+ DAC technology. For each technology, the latency of physical media must be added. In fiber or wire, the speed is roughly 5ns per meter. The 10GBase-T delay becomes the same order of magnitude as Solid State Disk latency, and therefore dramatically delays data delivery by nearly 50 percent. High latencies in the data center infrastructure results in delays in CPU and application works, therefore limiting data center efficiency and increasing operational costs. As power grid companies cap power supplies to data centers, IT managers have become sensitive to server power consumption. Data center managers aspire for the lowest possible power consumption technologies. It is important to note that for every watt of power consumed, typically two additional watts are needed for cooling. 10GBase-T components today require anywhere from 2 to 5 watts per port at each end of the cable --depending on the distance of the cable --while SFP+ requires approximately 0.7 watt, regardless of distance. When deploying thousands of cables in a data center, huge power saving can be achieved by choosing SFP+ DAC and fiber technology. New dynamics within data centers mandate that the cable infrastructure handles latency sensitive applications anywhere. When comparing 10GBase-T technology with the alternative SFP+ technology, it is evident that SFP+ is the right technology to ensure optimal performance with lowest latency in the data center. 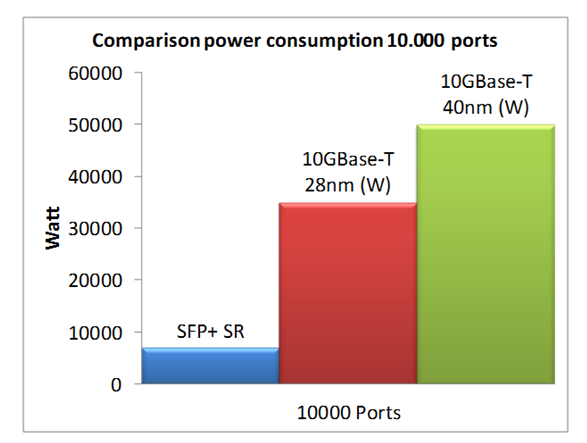 SFP+ technology delivers far lower power usage than the 10GBase-T technology. The cost saving becomes obvious when deploying from 1000 to 10,000 cables in the data center.